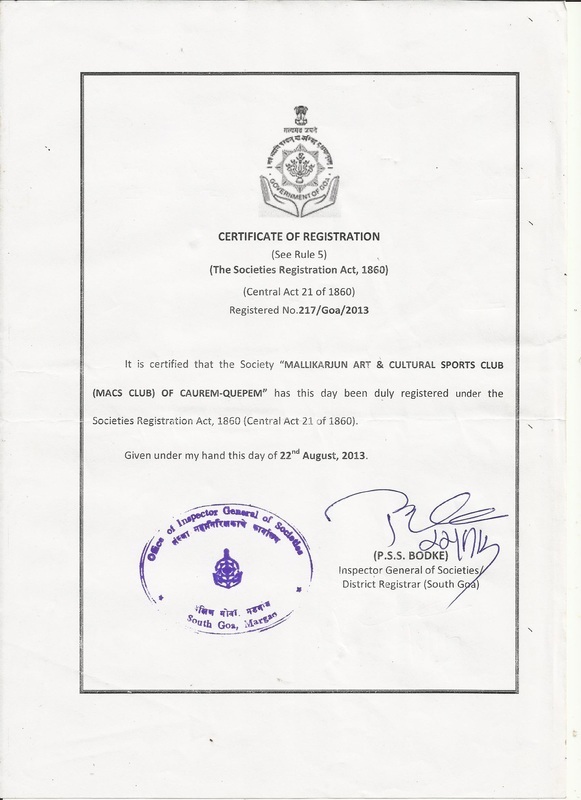 The Mallikarjun Art and Cultural Sports Club(MACS CUB) of Caurem is registered under "The Societies Act, 1860". To encourage and promote sports as well as cultural and social activities. To promote personal feeling and friendly relation among the member of the society. To promote encourage theatre activities also to keep in touch with new experiment in the field of & one act plays. To promote co-operation and friendly relations with the other societies with the objects and aims similar to this society. To promote and organize all kind of recitals, dance, entertainment, gathering etc. To raise the funds and add to it subscription and donation etc. To promote all types of environment friendly activities to enrich & preserve our environment. To encourage and promote participation of ST peoples in various sports, social and cultural activities. Place - Heritage Site of rare ancient rock carving near the bank of Kushawati River.